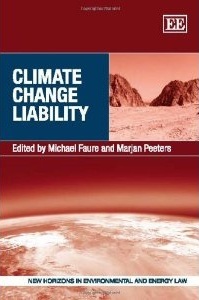 The book “Climate Change Liability”, edited by Michael Faure and Marjan Peeters in 2011, gives an overview on compensation prospects in the UK and in the Netherlands. The authors also analyze the situation under international public law and European law. The book discusses the idea of climate change litigation as a concept, but also assesses how it has been done and how a similar case can be done and legally succeed in courts and is therefore also a good tool to base some legal actions on. The first few Chapters the book discusses the role that national legal systems in the U.S. and The Netherlands can play. Later the author discusses how the same concepts can be used in the European Union, based on EU law, and court cases that are brought before the European Court of Human Rights (ECHR). This includes assessment of the transparency of firms such as the 2004 Taskin et al. v Turkey case, where the ECHR concluded that a state must not only determine complex issues of environmental and economic policy, but also that decision-making process by the state must include sufficient investigations and studies in order to be able to predict and evaluate the effects. Therefore a state within Europe must ensure that relevant information is made available so that take the necessary precautions in assessing possible climate change damages. In this book, in a broader context, the author warns about the urgency of acting now and bringing climate change law suits to court now. Global warming is no longer just a theoretical concept, but we are already starting to feel the effects of climate change all over the world. This is evident because and in the U.S. there are already law suits brought to court based on this premise. Because of this urgency the author warns about the necessity of acting now, and examines how litigation can be used as a tool to stop and combat climate change. He believes that litigation may work, but considers laws to battle climate change, such as EU ETS, ex-ante tools and litigation law suits ex-post tools because laws would stop climate change before climate change takes place. Litigation is an ex-ante tool, because injunction court cases in the U.S. are based on current damages already caused by existing climate change effects, therefore climate change has already started taken place. The current law suits that are asking for damage compensation for damage created from climate change are also based on current damages. Concerned individuals and organizations must therefore start such actions now for litigation to be effective at combating global warming, because climate change has already begun. Furthermore the author notes limitations in current cases inducing that currently, such litigation cases only have a few representative victims and a few defendants. Therefore a detailed record of damage claims would not only serve the purpose of evidence in the court, but would also create a basis for more fairly allocating the compensation. We at Claimer.org are collecting climate change damage claims on this link.